Crunch, crunch, crunch, crunch.....it's not only the sound, but the feel of leaves underfoot along the trail. I love it! This time of year has become a real favorite of mine for early weekend morning runs. As the sun breaks over the horizon you can't help but notice how this musical ground cover has left the tree line and trail canopies bare once again. Which is really nice for letting in the sun and taking a bit of the crisp out of the air. 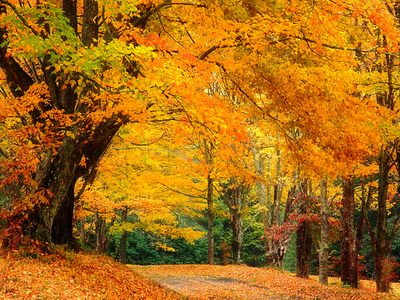 One other favorite of mine, speaking of the "musical", is the song Tho' Autumn's Coming On, as sung by Bill Gaither. It's on the Marathon playlist and has been on the iPod every since that little gadget came out. That said, there is no better time to listen than in the fall and running off-road. It brings about various emotions and reflections. I think of it as chicken soup for the October runner's soul. I hope you enjoy the video below and that you appreciate each day of the journey, regardless of the season!